Leading UK & Ireland motorhome rental company, Bunk Campers, has announced it is expanding its operations in the UK with a new motorhome hire depot at Heathrow, Europe’s busiest airport. Located just minutes from Heathrow Terminal 5, the brand-new motorhome hire depot will open in Spring 2019, serving the growing campervan and motorhome hire market across England. Following a record-breaking year for the company, the location represents an investment of over £1M for Bunk Campers. The new Heathrow depot is located outside of the London congestion zone and only a 6 minute transfer from Terminal 5, offering holidaymakers from 85 countries direct access to their motorhome adventure. A globally recognised tourism brand and trusted partner of some of the world’s leading travel promoters, Bunk Campers is one of the few multi-location rental companies in the industry. The new Heathrow depot adds to the company’s impressive network of depots across the UK & Ireland including Coventry, Leeds, Edinburgh, Belfast & Dublin. Bunk Campers will offer its full fleet of rental vehicles from the new Heathrow depot, including custom-built Volkswagen T6 campervans manufactured exclusively for the rental fleet by sister company Nomad Campervans. As the exclusive UK & Ireland rental partners for Weinsberg – German-built motorhomes from the Knaus Tabbert Group – quality and comfort are at the forefront of all rental vehicles with 2-6 berth options available to suit couples, groups of friends and families alike. From the new Heathrow depot, Bunk Campers customers will also be able to tour Europe with Bunk Campers specialised European Cover. Alongside the new depot, the investment represents a 25% increase in fleet with several new jobs being created across a variety of disciplines including operations, customer service and vehicle detailing. To celebrate the launch of the new Heathrow depot, Bunk Campers are offering 30% off all England rentals in May and June when customers book online at www.bunkcampers.com. Bunk Campers customers can also enjoy permanent discounts of up to 30% on overnight pitches at The Camping and Caravanning Club sites across the UK. Established in 2007, Bunk Campers has grown to become one of the largest campervan & motorhome hire companies in the UK & Ireland. Bunk Campers serve the UK and Ireland’s main inbound tourism hubs from their six rental depots, strategically located close to Birmingham, Leeds, London Heathrow, Edinburgh, Belfast & Dublin airports. Bunk Campers are the exclusive UK & Ireland rental partners of Weinsberg Motorhomes, working closely with the Knaus-Tabbert Group to offer high quality, German-built motorhomes, manufactured to Bunk Campers exclusive specification for the UK market. Every year, Bunk Campers releases a large volume of its nearly-new campervans & motorhomes for sale through its sister company, Camperco. 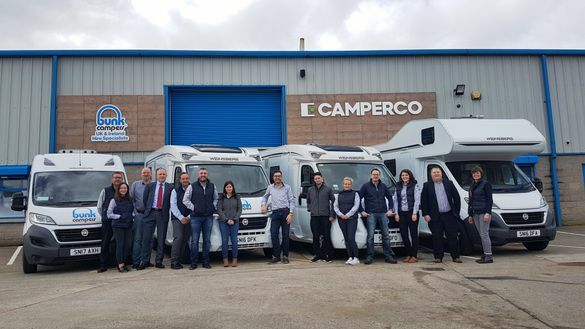 In 2018, Bunk Campers and the Camperco Group was acquired by motorhome rental giant the Apollo Tourism & Leisure Group; one of the world’s largest motorhome rental companies as part of a major European expansion plan.